// Load a Landsat 8 top-of-atmosphere reflectance image. // Convert the RGB bands to the HSV color space. // Swap in the panchromatic band and convert back to RGB. // Display the pan-sharpened result. // Load a Landsat 5 image and select the bands we want to unmix. The unmixing result should look something like Figure 1. Figure 1. 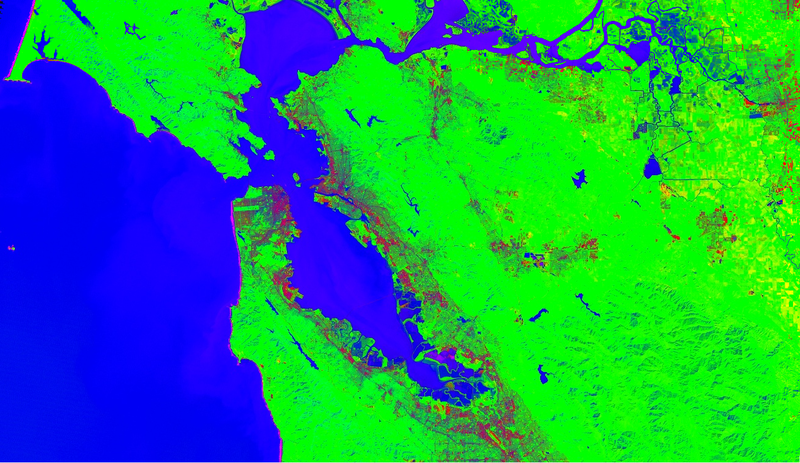 Landsat 5 imagery unmixed to urban (red), vegetation (green) and water (blue) fractions. San Francisco bay area, California, USA.